Students are natural curators that find, share, collect and organize information about a specific topic or interest— so we're not surprised that they are one of the fastest growing communities on Mix. Curation on Mix goes beyond collecting articles you like or want to read later on Mix. Our best curators emerge as topic experts in niche interests and add value to others by sharing their finds. In a world of news feeds, information saturation and oversharing, human curation is a valued skill set. Are you a student? Here’s how you can make the most out of Mix. Easily add your favorite links and organize the them into your own custom collections like Literature or Business. 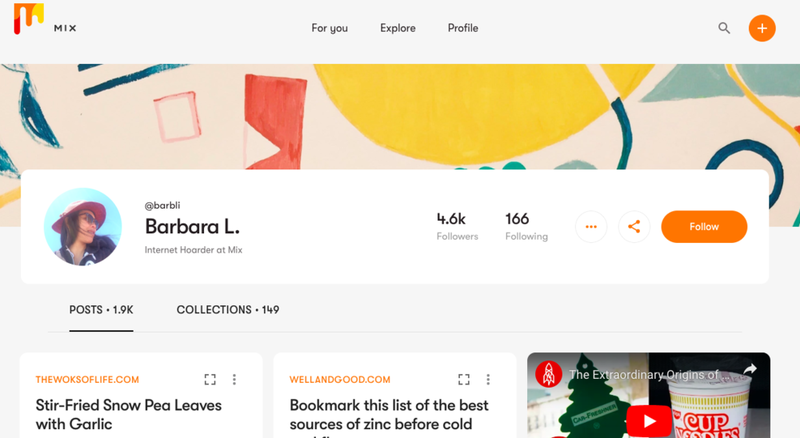 Brush up on a topic by browsing content that’s already being shared by people on Mix, by people you follow or specific collections you’re subscribed to. You'll see it all in your Following and For You tabs. Hint: the quickest way to add your favorite links from anywhere on the web is through the Mix Chrome or FireFox extension. Quickly and easily share a link to your collections with friends or classmates. They can follow you to keep up as you add things they might be interested in or they might want to add to collections of their own. Or just share links to collections that align with their specific interests or passions like Art Appreciation or Fruitful Finance - they might want to subscribe to get updated with your latest saves. Pretty pictures, stories from friends, and social platforms are part of our everyday lives... take a break to discover and learn something new on Mix. Subscribe to topics you’re into and follow people to uncover more hidden gems you wouldn’t find anywhere else. Whether you’re into true crime or the environment —we’ll work to show you the things you love. Start your own collections of stuff would want to read later, really enjoy, or just want to bubble up into our ecosystems for others to discover. Anyone can curate and browse on Mix.